Heat oven to 350°F. Grease bottom only of 8- or 9-inch square pan with shortening, or spray with cooking spray. In large bowl, beat cake mix, water, 1/2 cup butter, cinnamon, nutmeg, 2 teaspoons vanilla and eggs on low speed 30 seconds. Beat on medium speed 2 minutes, scraping bowl occasionally. With spoon, stir in carrots and pecans. Spread in pan. Bake 36 to 41 minutes for 8-inch pan or 33 to 38 minutes for 9-inch pan or until toothpick comes out clean. Cool completely, about 1 hour. In large bowl, beat cream cheese, 2 tablespoons butter, 1/2 teaspoon vanilla and 1 teaspoon milk with electric mixer on low speed until smooth. Gradually beat in powdered sugar, 1 cup at a time, until smooth and spreadable. If frosting is too thick, beat in more milk, a few drops at a time. Stir in coconut. Spread frosting over cake. Finely shredding the carrot and finely chopping the nuts spreads their goodness through the whole cake and makes it easier to cut, too. The ratings and reviews speak for this gluten-free carrot cake! Countless commenters remarked that nobody they served this to could tell it was gluten free. That’s how you know it’s a great gluten-free recipe! 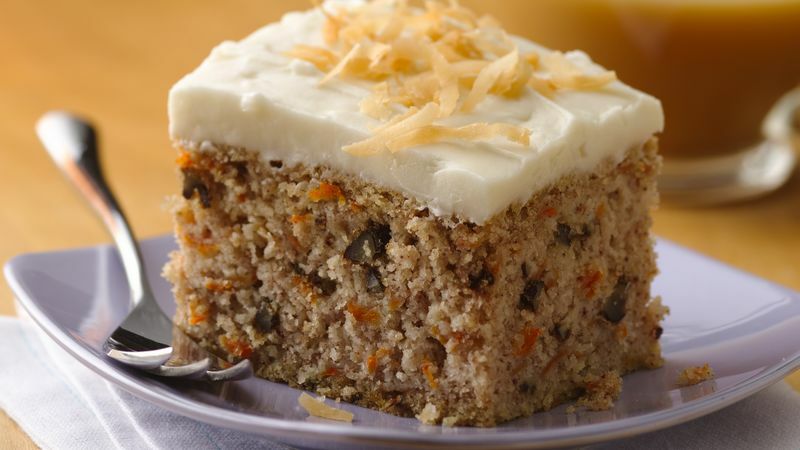 This carrot cake starts with Betty Crocker™ gluten free yellow cake mix, then simply add classic spices, carrots and nuts and you’re on your way to deliciousness. Once the cake cools for an hour (we know — it’s hard to wait! ), it gets covered in irresistible cream cheese frosting, with coconut flakes for a tasty twist, if desired! Not gluten-free? We’ve got plenty of other carrot cake recipes, too. Looking for cake-making tips before you begin? You know Betty’s kitchen-tested tips are the ones to trust!